Yay! Testing! My beloved pet peeve! When I wrote the step by step article on how to set up for testing on Windows, I optimistically and somewhat dismissively wrote I am 100% sure you can easily show your friendly marketer how to do all of this on her Mac if she has one. Turns out I will run a lab at the Adobe Summit in Las Vegas in March, and it is highly likely the machines we use will be Macs. So all of a sudden, I find myself in the situation where I have to actually tell our lab admins what I need. And since it is not quite so straight forward, I take this opportunity to note it down for you, too. This article shall follow the Windows-equivalent closely. Some of these things are present on your average Mac, like git and maybe the JDK. For the rest, we start with a quick detour — we shall install Homebrew, since my developer colleagues here at Adobe say that’s the easiest way to install the rest. 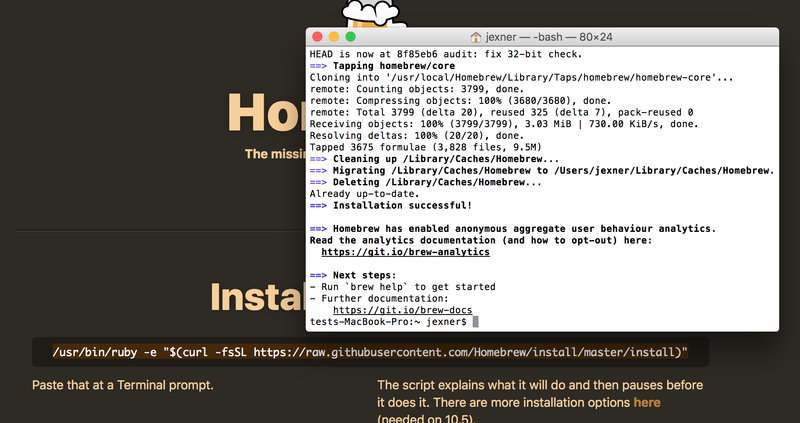 Do you need to install Homebrew? If you get an error, install Homebrew. Open a terminal, then copy and paste a single line into that and hit enter. Now try that test above again. Works? Cool. Since we’re using Homebrew, this is almost ridiculously easy. Download and install Chrome Canary. While you could test with your standard Chrome, I would use Canary as a fresh, non-customised, raw testing tool. I suggest you create yourself a folder and work inside it. I call mine “dev”. Watch git download some stuff.